Ouch! Market woes drive AAPL below $100 at today’s opening bell — A precipitous drop in the Chinese Shanghai Index resulted in markets around the world opening well below Friday’s closing prices. 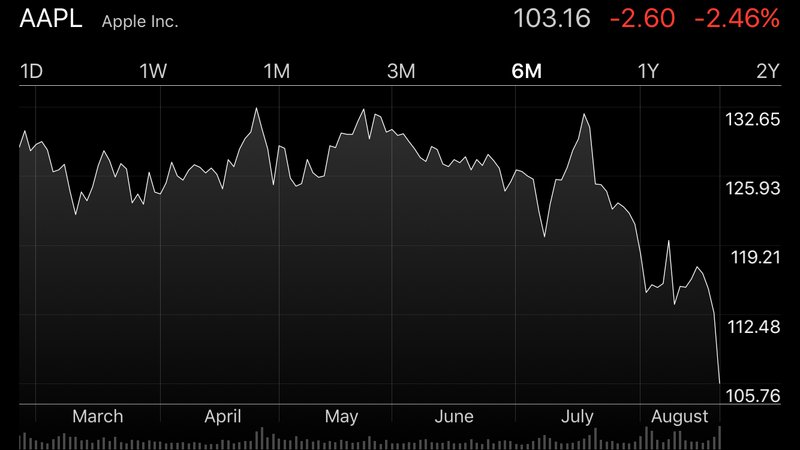 Shares in Apple opened below $100 at $94.87 before bounding back into safer territory. About one hour after the opening of the New York Stock Exchange and NASDAQ this morning, AAPL was hovering around the $104 mark. CEO Tim Cook discusses Apple’s participation the US ConnectED program — There was talk that Apple would announce a new education initiative this week. However, the company is instead emphasizing its participation in the US ConnectED program. Apple CEO Tim Cook appeared in a pre-recorded segment on Good Morning America today and discussed this with co-anchor Robin Roberts. It’s time to take Mac gaming to the next level — In an opinion piece for TechRadar, Matthew Bolton says “Macs don’t represent a great deal for someone who wants high-end gaming, but they shouldn’t be dismissed because of that. The range of games is already strong, and is only going to grow further – and you can run Windows for the rest.” Big games are coming to Mac more quickly, new indie games tend to hit Mac at the same time, and Mac hardware is looking better and better for gaming. He’s right, of course, but I’d love to see Apple make moves to improve gaming on our favorite computing platform. EverWeb is a web-design app that plays nice — Every element of EverWeb’s simple interface is easily in reach when you need it, and out of your way when you don’t. The central layout window’s surrounded by your site structure on the left, a toolbar along the bottom of the screen, and a multi-tabbed Inspector pane for adjusting individual elements on the right. Not vital, but Cockatoo offers a handy tool for controlling/accessing iTunes — If the iTunes Mini-Player option in iTunes doesn’t quite serve your iTunes management, Cockatoo from Intuitive Code might be for you. It lets you easily control the iTunes music player.